It is past one year since beginning my blog. It seems like just yesterday I posted the first post. If Lanternlight didn’t comment about my posts, I would not have coninued my blog. I think he is first my reader. And if my English teacher didn’t check my posts, I would not have posted in English. Plus, the other people who read my blog and comment about my posts. Thank you, I appreciate it. Anyway, when I started to post my blog, I wanted to go abroad on business. But I have not been a good chance. It is difficult to get a new chance. I've enjoyed your blog Lucy. It's a lot of fun and very informative. Thank you. Acutually, it is difficult to read the other blogs in English. But sometimes I try to post about your blog. See you!! If Lanternlight didn’t comment about my posts, I would not have continue my blog. No problems at all, I do enjoy reading your blog. So you don't think you'll be travelling abroad any time soon? 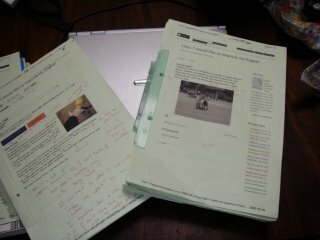 Keep on doing this blog, Lucy, it's always interesting to get a small insight into everyday's Japan. Those small mistakes you make do not really count. Believe me: I make bigger ones. I might know more words and more rules than you do, and that's why I make bigger mistakes. Thank you. Acutually, my husband don't like travelling abroad on business. But last week, he went to Shanghai. I don't have any chance yet. Thank you for comments about my posts and encouragement. We will enjoy posting our blog. And I know I must not be afraid of my mistakes. But sometime I am afraid of my mistakes. Especially, after I read the other people's blog, I comment something, but my comments is bad comments for other people. And I was afraid that people misunderstand me and Japanese. Well done on getting to your first year Lucy. You have a great little blog happening here. It is very informative about the day to day life of someone from Japan. It's a great little read. I feel happy to post something. You have a nice friend who is Cazzi. And I met you and Cazzi. Posting blog is very interesting.